One of the beautiful things about DBA is that all of the armies are the same size. Once you paint 12 elements, you have a complete army and you never have to paint anything for that army again. Except, it’s a lie! A dirty, dirty lie! In order to field all of the available options for some armies, you have to paint far more than the 12 minimum required elements. The winner of this dubious award is Medieval French, requiring 29 elements to field all possible options. Apparently I got off easy painting these Medieval Germans, which only require 20 elements for the (a) list. I painted all options except the 2x4Pk, but I included an extra Knight so I could field it as a DBA 2.2 (b) list as well by using deep sabot bases for the 6Kn elements. The elements are 6x3Kn, 4x4Sp, 4x4Bd, 2x3Ax, 2x2Ps, 1x4Cb. This will build the dismounting knights for IV/13a or the double-based knights from IV/13b. In the proposed DBA 3 lists, this builds the IV/13b list with mandatory blades but no dismounting. The Knights: 6x3Kn, or 2x6Kn, 2x3Kn. Even though the army lists are under revision and will likely change before DBA 3.0 is released, I’m confident that I’ll be able to field a legal Medieval German army with these elements. All of the shields are hand painted. 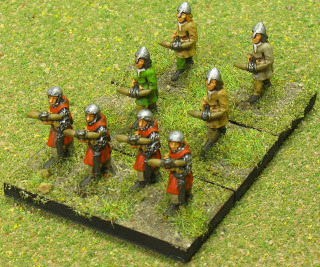 The foot figures use painted highlights on their red coats, but I used a Devlan Mud wash on the horses for expedience. I skipped painting lions on the horse cloths, but I bet you didn’t notice, did you? I decided that one of the main reasons I don’t like most of the Medieval DBA armies I’ve seen is that they are too gaudy. Typically, people either paint a wide variety of generic coats of arms that may or may not be accurate, so they can morph the army for use as any medieval army; or they accurately research 30 different coats of arms and it still ends up looking to me like a bazooka festival at a paint factory. 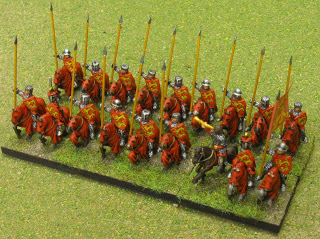 The best looking German army I’ve seen was painted by Scott Ludwig, and his work is directly responsible for convincing me to paint a Medieval army. 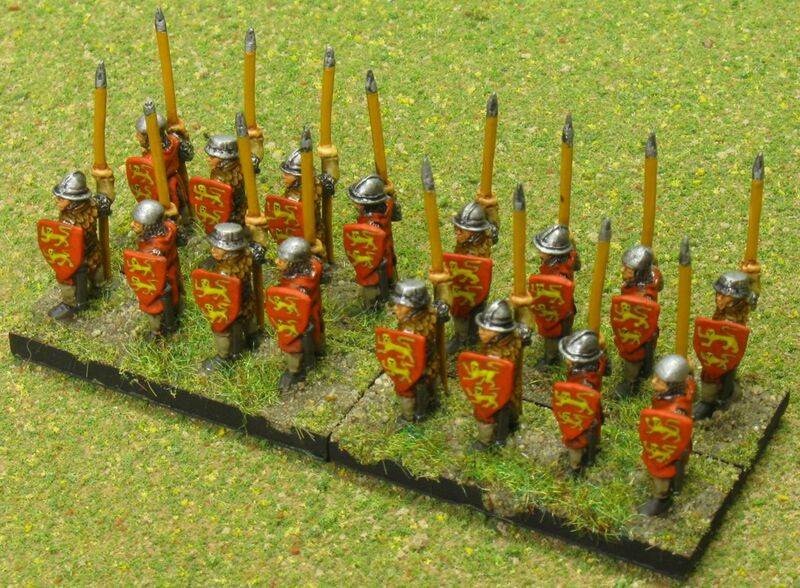 He chose a single set of heraldic devices and painted a unified color scheme across the whole army. I decided that whether or not it was accurate, I’d do the same thing. Since I was looking for an ally for King Valdemar II the Victorious of Denmark, I chose the coat of arms of Braunschweig. Otto I “the child”, duke of Braunschweig-Lüneburg, was Valdemar II’s nephew, and allied with Denmark against all enemies in the first half of the 13th century. Things started to go wrong at the Battle of Bornhöved, where they both lost, and Otto was captured and imprisoned. The figures themselves are from Black Hat miniatures, part of the old Gladiator line. These are very nice figures, I have absolutely no regrets regarding my figure choice. They are well sculpted and highly detailed. The faces are very distinctive, and I could see how someone might not like them, but I definitely do. This is the same manufacturer that made the Auxilia I used in my Leidang army, and they definitely go well together. 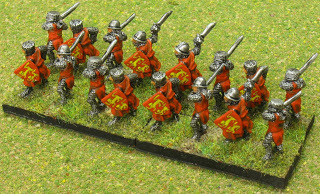 4x4Bd, dismounted knights for IV/13a. The Knights and Blades are technically a bit late for the Battle of Bornhöved. They are closer to 1275 than 1227. If I believed Denmark should be using primarily kite shields at this time, why didn’t I think the same for Germany? It’s not like they’re very far away from each other. Instead, I bought a few more blades to augment my Leidang in case we ever decide to field a triple army. 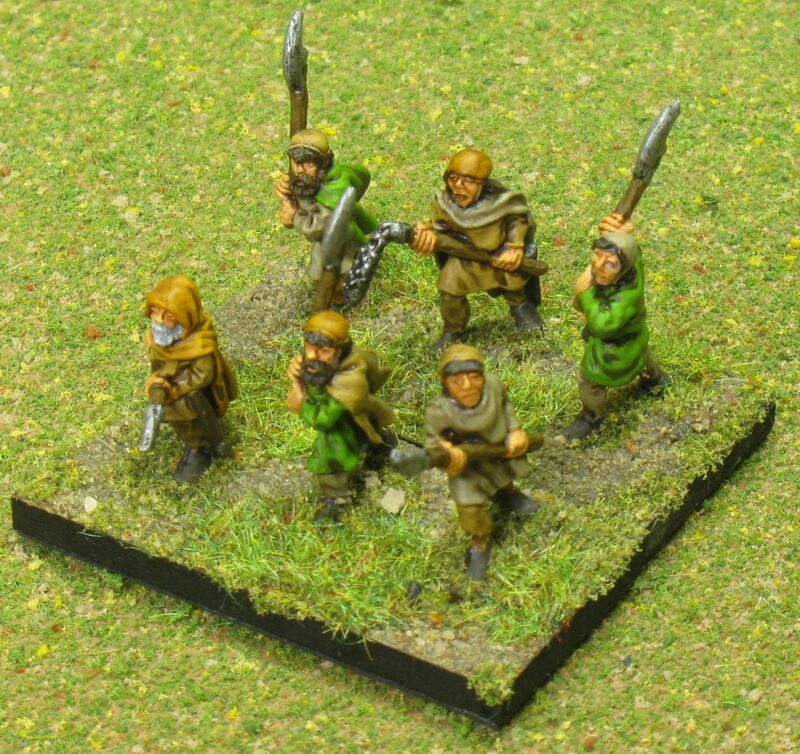 I am very pleased with the way this army turned out, but slightly paranoid about the accuracy. I like to get things correct, but I’m not willing to spend money or an inordinate amount of time to ensure that they’re correct. In the mean time, I can sustain myself with the dubious honor that comes with painting 82 microscopic yellow lions. After a bit more research, I can say you're absolutely right: this coat of arms was apparently patterned after the English coat of arms, which had 3 lions instead of 2. I think I'll put more details in another blog post for future reference.